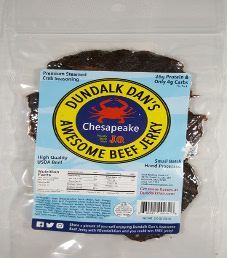 This Dundalk Dan’s Awesome Beef Jerky brand named is distributed by Hard Working Foods LLC, and are located in Baltimore, Maryland. It started in 2012, where Dundalk Dan and his family began making beef jerky. 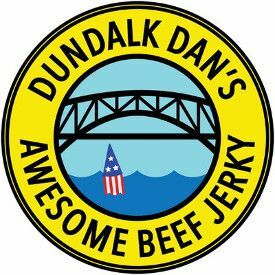 After spending years perfecting their recipes, the Dundalk Dan’s Awesome Beef Jerky brand named was launched in 2016. Recently, they teamed up and now officially co-market with the finest Maryland Crab Seasoning: J.O. Spice. This jerky is advertised to pack a no-nonsense attitude, leaving out the artificial ingredients, and instead providing simply the best taste. 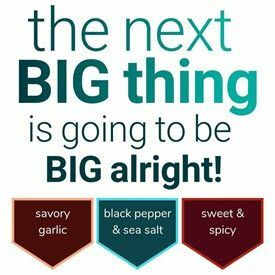 The liquid marinade consists of a poor quality Worcestershire sauce, water, a good quality gluten-free tamari soy sauce, healthy honey, very healthy apple cider vinegar, and respectable Tobasco sauce. It is unfortunate that the Worcestershire sauce uses the oil derivative propylene glycol and artificial flavor. The J.O. Brand #1 all purpose seasoning seems wholesome enough, with no untoward ingredients used. Healthy ingredients such as garlic powder, onion powder, and cayenne powder are used. The sugar level is respectable at 2 grams of sugar per 28 grams of jerky. As for the salt level, it is very high at 620mg of salt per 28 grams of jerky. Our preference is 350mg of salt or less per 28 grams of jerky. This jerky does qualify to have no sodium nitrite, or any other similar unhealthy preservatives. Instead, the main preservative used is salt, and apple cider vinegar to a lesser extent. This flavor does not qualify to have no MSG added because the highly processed, cheap flavor enhancer hydrolyzed vegetable protein is used in the Worcestershire sauce. 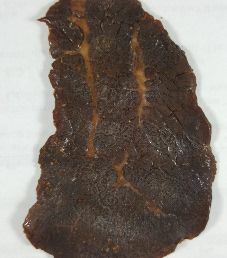 These strips of jerky are medium in size, and sliced to a medium, almost thin thickness. The texture is fairly dry, but still reasonable to chew. There are very little signs of fat, and handling this jerky leaves no oily residue on your fingers. The most dominating flavor is the Worcestershire sauce, and soy to a lesser extent. At light levels are onion, garlic, and black pepper. As for the J.O. crab seasoning, it is at a light level. While it does not exactly taste like crab, it does have a seafood type of flavor, which turns out to work very well with jerky. The crab is more of an aftertaste, and could stand to be at a higher level. The cider vinegar gives the flavor a slight tanginess. There is little sweetness, which allows a good amount of natural beef flavor. The Tabasco is also at a light level, but tends to get drowned out by the high level of saltiness. Overall, a very pleasant tasting flavor that sort of mimics blue crab, but the salt level tends to overpower everything else. A 2 ounce/56 gram bag sells online for $6.00. That works out to $3.00 an ounce, which rates as an expensive price. 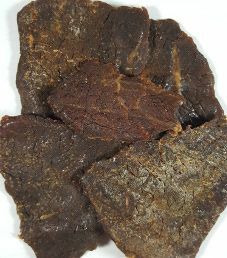 This jerky is recommended as worth tasting for the light taste of seafood, which is actually rare in jerky. This clear plastic, resealable bag has a label affixed to the front, and a best before date sticker on the back. There is crab printed on the bag, and states “Proudly Made With J.O.” Commendably, this bag is vacuum sealed, which is the best way to keep jerky fresh tasting. The only bag category missing is a blurb about the flavor and jerky brand. To the credit of Dundalk Dan’s Awesome Beef Jerky, there is a phone number provided for customer inquiries.